This soap is scented with bright wild poppies, with hints of magnolia blooms, sparkling peach wine, and a light touch of sugared fruit water. 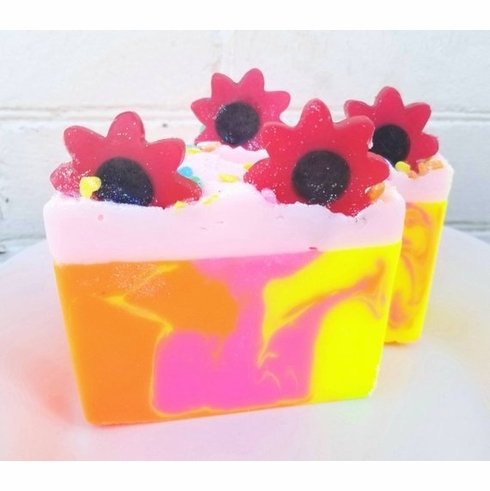 Soap has neon pink, yellow, and orange swirls, and is topped with fluffy pink soap, glittery heart sprinkles, and 2 soap poppies. Soap weighs about 6.5 oz. It is a vegetable glycerin soap bar infused with goat milk, coconut oil, avocado oil, and olive oil.